The Philippine Nurses Association of America announces the PRIDE Awards for Newsletters. Local chapters may now submit their newsletters for consideration for the PRIDE awards. Looking for a way to advance your professional development? Want to take advantage of an opportunity to interact with students, researchers and practitioners to present your new and innovative work and to obtain feedback from your peers in an informal setting? JOIN US IN JERSEY CITY, NEW JERSEY on July 29,2018 HAVE A GREAT TIME @ Lincoln Park. Let‘s GO ! iPNAA App Now Available for Download! iPNAA app now available for download for iOS and Android users. Applicant must check selection as it applies and attach evidence (CV not considered). 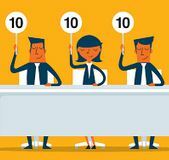 Validator must validate both selection and evidence. To be considered as potential awardee, the applicant must have > 90 points. All documents: Curriculum Vitae (CV), completed application form, 2x2 size photo, signed agreement for publishing and supporting documents photographed from its original form are to be emailed to Grace Diaz-Font at gfontrn@sbcglobal.net . There should be 2 complete sets of application, one with the identifying information and another without any obvious identifying information for the blind review. Here’s yet another pride for PNAA. Congratulations are in order for the paper "Filipino Nurses in the United States" by Leo-Felix M. Jurado, PhD, RN, APN, CNE, NE-BC, FAAN and Marlon Garzo Saria, PhD, RN, AOCNS, FAAN that made the cover page of Nursing Management, March 2018. The PNAA Nursing Scholarship Applications for 2018 are now being accepted. The completed applications are due on April 25, 2018. Please check the attached application form for instructions. The Journal of Nursing Practice Applications & Reviews of Research (JNPARR), the official international, peer-reviewed publication of the Philippine Nurses Association of America, is calling for authors to submt manuscripts. The JNPARR covers topics on Nursing Practice, Education, Administration and Research. On behalf of Philippine Nurses Association of America (PNAA), I write to urge support for Assembly Bill (AB) 2034, a bill that will require transit employees in bus, train, or light-rail operations to undergo human trafficking awareness training by January, 2020. We, the undersigned organizations, share a commitment to keep children, parents, families, teachers, responders, and administrators safe. We are writing to urge Congressional leadership to launch a bipartisan National Commission on Mass Shootings within the next thirty days. We need your help in making sure we have the most up to date link to your chapter website. Please send us your website link information and update on your chapter President and President-Elect. Do you want to be a part of PNAA's history? Enter to win a chance to name and design the PNAA Legacy Book. Book launching - 39th PNAA National Convention, July 2018. 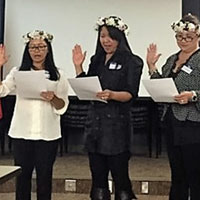 Philippine Nurses Association of America (PNAA) Inc. is the professional organization of Filipino-American Nurses with over 4,000 members, majority of which are legal immigrants. PNAA strongly opposes the repeal of the Deferred Action for Childhood Arrivals (DACA) program. This program was created under the Obama Administration in 2012 that allowed nearly 5,000 young Filipinos – along with 800,000 other individuals – to receive work permits and to be protected from deportation. DACA has afforded true representation of security and opportunity of the American Dream. 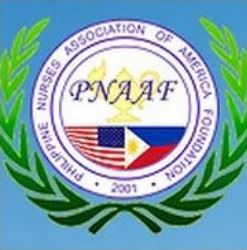 The Philippine Nurses Association of America (PNAA) joins the American Nurses Association (ANA), the Utah Nurses Association (UNA) and registered nurses across the country in voicing against the atrocity over the treatment of a registered nurse in Utah who was handcuffed and arrested by a police officer for following her oath, the hospital's policy and the US Constitution. Two Fellows will be selected and each awardee will receive $1000 to support a health/nursing research activity or related scholarly project that has implication in nursing practice, education, scholarship, administration and reasearch. The Fellowship is for a one-year period, starting in July 2017 and ending in July 2018. Deadline of application for the PNAAF Fellowship Award is June 30, 2017. Looking for a way to advance your professional development? Want to take advantage of an opportunity to interact with students, researchers and practitioners to present your new and innovative work and to obtain feedback from an international audience of your peers in an informal setting? Consider writing an abstract. Abstract submissions are being accepted now until April 15, 2017. Walden University’s online degree programs are designed to provide you with the skills you need to grow as a professional and make a difference in your organization. Now, top-quality education has never been more affordable. Top-quality education is within your reach right now. Go to www.waldenu.edu/PNAA for additional information and how to get started. The Philippine Nurses Association of America (PNAA) is proud to announce that it has selected four (4) distinguished nurse leaders as its 2017 Leadership Fellows. The PNAA Leadership Fellows Program is a yearlong program that supports the leadership development of Filipino descent in the United States through education and mentorship. This initiative serves as a vehicle to engage and empower nurses who seek high-level careers in leadership and management, education and research. Please take time to nominate your nurse colleague, peer, friend, mentor and/or leader for the 2017 PNAA Nursing Excellence Awards. Download Nomination Forms here. Deadline for electronic submission for all nominations: on or before 11:59 PM Pacific time on February 10th, 2017. PNAA invites you to submit your completed clinical, leadership, or research projects for presentation. We also want to invite Masters and Doctoral students to submit an abstract of their thesis, capstone or dissertation proposal for a Dialogue with Researchers: a Proposal Critique Session. Deadline: April 1, 2017. In recognition of her more than 40 years as a nurse, educator and advocate focused on cancer survivorship, Dr. Karen Meneses has been named UAB’s 2016 Distinguished Faculty Lecturer, the Academic Health Center’s most prestigious faculty award. The Journal of Nursing Practice Applications & Reviews of Research, the official international, peer-reviewed publication of the Philippine Nurses Association of America, is calling for authors to submit manuscripts. Deadline for Submission: March 30, 2017, Publication Date: July 2017. Malacañang Palace, December 19, 2016 - In conferring the Banaag Award to the Philippine Nurses Association of Metropolitan D.C. Inc., the President recognizes its exemplary services in helping Filipino nurses be integrated in Metropolitan D.C., and philanthropic spirit in helping thousands of underprivileged individuals and families in the United States of America and the Philippines. The Philippine Nurses Association of America (PNAA) asserts that a successful rehabilitation program is an essential component of the War on Drugs. The right to treatment is a fundamental right, rehabilitation treatment is a health right – certainly, it falls under the scope and range of Human Rights. Please take time to nominate your nurse colleague, peer, friend, mentor and/or leader for the 2017 PNAA Nursing Excellence Awards. Download Nomination Forms here. Deadline for electronic submission for all nominations: on or before 11:59 pm Pacific time on January 27th, 2017. The PNAA Leadership Fellows Program is opened to all PNAA members and supports the leadership development of Filipino descent in the United States. Through education and mentorship, the program serves as a vehicle to engage and empower nurses who seek high-level careers in leadership and management, education and research. Application Due: January 2nd, 2017 at 11:55 PM, EST. Congratulations to our New PNAA Chapter - PNA New Mexico! The PNAA Nursing Scholarship Applications for 2017 are now being accepted. The completed applications are due on January 06, 2017. Please download the Scholarship guidelines and Application form for more details. The Philippine Nurses Association of America is proud to announce the induction of its members into the American Academy of Nursing who have made significant contributions to nursing, health care and society. The Philippine Nurses of America Foundation is extending its invitation to all of the PNAA Family to its 4th International Collaborative Conference that will be held at the Convention Center in Legaspi City, Albay, Philippines on January 19 - 20, 2017 in collaboration with Bicol University. We hope you will be able to join us to this exciting event. Thank you for giving the Philippine Nurses Association of America Foundation (PNAAF) the opportunity to serve you better. Please take a few minutes to respond to this survey. We appreciate your input and want to make sure we meet your needs and expectations. Deadline for survey responses is on October 15, 2016. 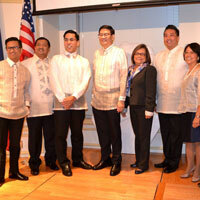 WASHINGTON, DC — Inspired by the life of Florence Nightingale – the 19th- century nurse who helped revolutionize the nursing profession – three Filipino American nurses recalled their climb to success and challenged their peers to not simply be content as bedside nurses, but to also become leaders capable of changing the workplace. Please join me in welcoming and congratulating the newly installed officers of the NCR chapters PNA Indiana, PNA Greater Kansas City and PNA Michigan! We thank all of them for their willingness to serve our beloved organization, the PNAA!